Much like women seem to be addicted to buying shoes and handbags they don’t need, I seem to be addicted to buying camera bags I have no use or room for. My biggest is a Dakine Mission rucksack that can take several full frame SLR bodies, all my lenses including my Canon 70-200 f2.8L IS and more. I have small and medium size Lowepro bags to suit every camera type I own but these are all thin over the should types. 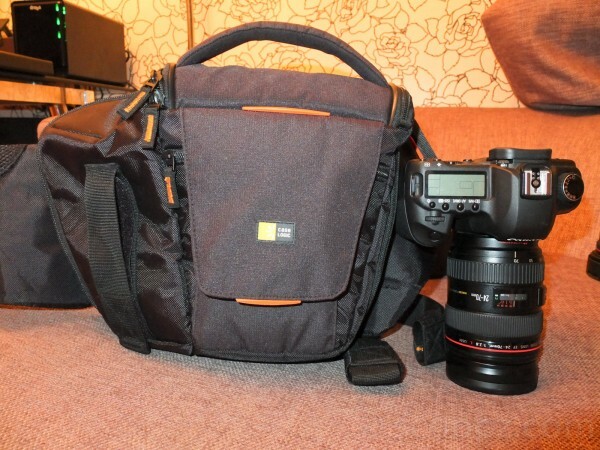 I’ve never found a good compromise between size, comfort and useability, until I came across the Case Logic SLR Sling bag (aka the SLRC-205) which is perfect for any full frame SLR (excluding ones with additional battery grips fitted and the pro-series ones with large battery grips). Here’s a quick snap of the SLRC-205 alongside my Canon 5D Mark II with Canon 24 -70 F2.8L lens.